Two-seat conversion trainer, weapons trainer and light attack aircraft. 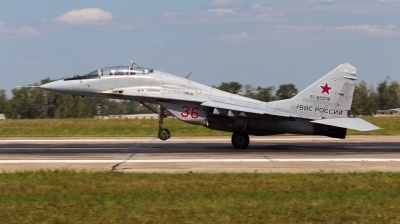 The MiG-29UB (NATO reporting name "Fulcrum-B") is the two-seat conversion trainer variant of the single-seat MiG-29A fighter. 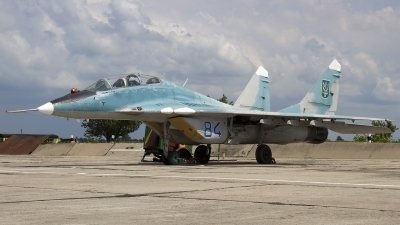 Most Soviet fighter designs include a two-seat equivalent for conversion training, often sacrificing combat capability for the extra seat. Such is the case with the MiG-29UB. The single-seat variant's NO-193 RADAR was removed and replaced with a more streamlined nose, sans RADAR. The IRST, laser rangefinder, canon, and under-wing hard-points were kept for limited combat capability. 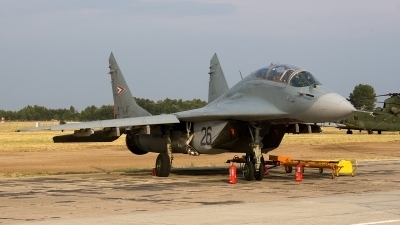 Every operator of the Mig-29 has a number of two-seaters in the inventory. 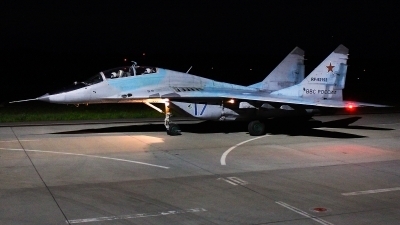 Upgrades to existing Mig-29UB's, to add more effective combat capability, have been marketed in the form of the Mig-29UBT with Yemen being the only operator thus far. 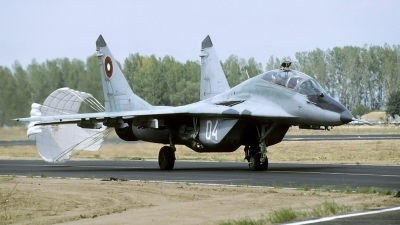 India's Mig-29K naval variant of the Mig-29 is based solely on the Mig-29UB with fully combat-capable single and dual-seat versions. 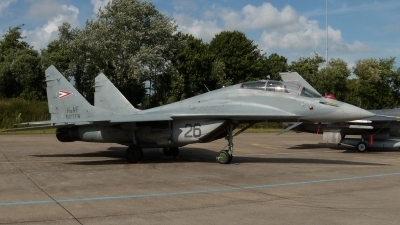 The Mig-35 development of the Mig-29 is also based on the Mig-29UB. Some examples have been imported to the United States for evaluation by the USAF/DoD and by a few wealthy collectors. 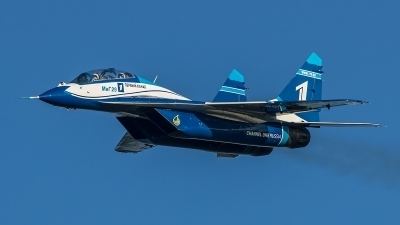 Privately-owned Mig-29's in the U.S. are listed by the FAA as flyable. In 1996 a Cuban Mig-29UB shot down two Cessna 337's which had violated Cuban air space, spreading leaflets. 1x 30 mm GSh-30-1 cannon with 150 rounds. 4 x R-60 (AA-8) "Aphid" AAM's. Wing Span: 37 ft. 3 in. Height: 15 ft. 6 in. Algeria, Armenia, Azerbaijan, Bangladesh, Belarus, Bulgaria, Cuba, Eritrea, Hungary, India (IAF/IN), Iran, Kazakhstan, Malaysia, Myanmar, North Korea, Peru, Poland, Russia, Serbia, Slovakia, Sudan, Syria, Turkmenistan, Ukraine, United States, Uzbekistan, Yemen.